"You see!" Norman says when we've moved a polite distance away. "Someone was genuinely worried about the lands. Not just his own lands - but all the lands. He paid money-"
"Ok, shoes. The point is, he paid out of his own pocket to have the disease dealt with. He paid us, we helped him, he helped everyone. Everybody wins. That's what being the good guys is all about. Get it now?" I smile big enough that all three rows of teeth are showing. "A guy named Eagan Peltskinner asked you to kill him some wolves and you didn't think that was at all odd?" "And what did he ask you to do with the wolves?" "Well, he had us bring him the pelts. To prove that we did the job." "He was looking right at us the whole time. He was twenty paces away. Why does he need proof?" Norman looks back towards Eagan doubtfully. "Maybe he ..."
"Maybe he's named Peltskinner because his family business is collecting animal pelts for sale. And he just tricked you into fighting some dangerous wolves and skinning them for him." "That's why he asked you to kill just eight. If you killed them all it might actually stop the disease and he wouldn't be able to pull this trick on the next dunce that comes along." "And he didn't even pay you money. He paid you shoes! How much will those shoes be worth when you unload them?" In case you're actually curious: Seven copper. Level 1 quests usually pay 40c. "I won't! I ... I want these shoes. This was a fine payment!" He sits down on the ground and starts pulling them on right there. It takes a while. The shoes seem a little small. "What if Eagan had said to you straight up, 'I collect animal pelts for a living. If you'll bring me the pelts of eight dangerous, disease-ridden wolves I'll give you these tiny shoes.' Would you have agreed to that?" "Maybe!" he says in a tone of voice which indicates he knows just lost this argument. "So. Are we done wasting our time being good guys now? 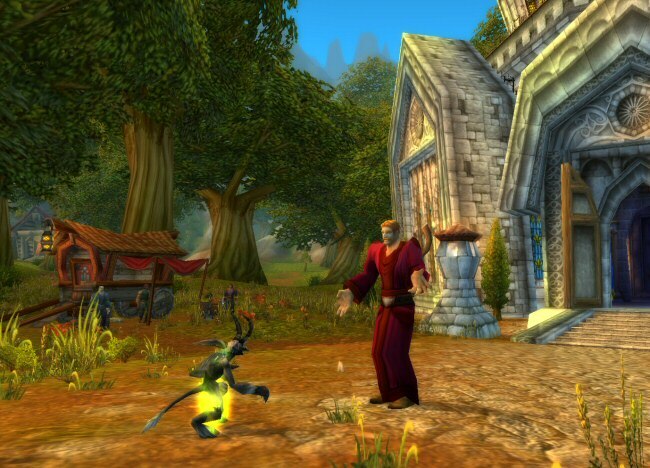 Or do you want to keep on questing for new ways to get reamed by the locals?" "I summoned you so I could help people, and that's what we're doing!" "Fine. Pay's the same for me either way. So who can we find to screw you next?" "I don't know. Let's ask around." Next Week: Norman tells the tale of when he sacrificed a virgin! No really.